The cavernous sinus is a paired dural venous sinus located within the cranial cavity. It is divided by septa into small ‘caves’ – from which it gets its name. 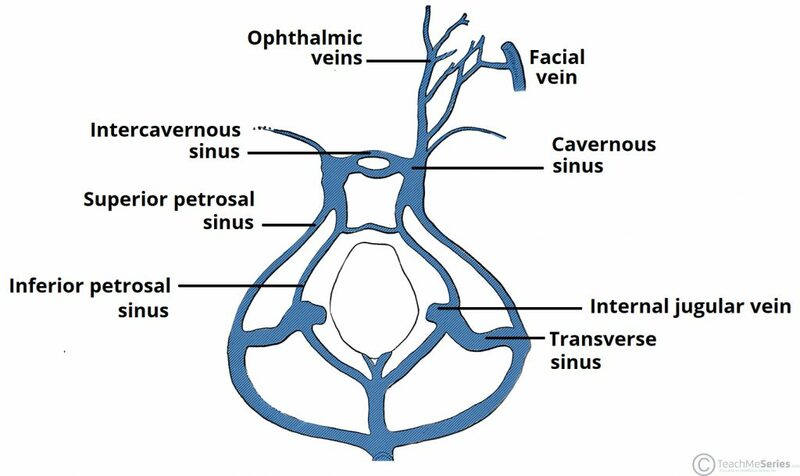 Each cavernous sinus has a close anatomical relationship with several key structures in the head, and is arguably the most clinically important venous sinus. In this article, we shall look at the anatomy of the cavernous sinus – its location, contents and clinical relevance. The dural venous sinuses are channels between the two layers of dura mater which are responsible for the venous drainage of the brain, skull, orbit and internal ear. Read more about their anatomy and function here. The cavernous sinuses are located within the middle cranial fossa, on either side of the sella turcica of the sphenoid bone (which contains the pituitary gland). They are enclosed by the endosteal and meningeal layers of the dura mater. Anterior – superior orbital fissure. Posterior – petrous part of the temporal bone. Medial – body of the sphenoid bone. Lateral – meningeal layer of the dura mater running from the roof to the floor of the middle cranial fossa. 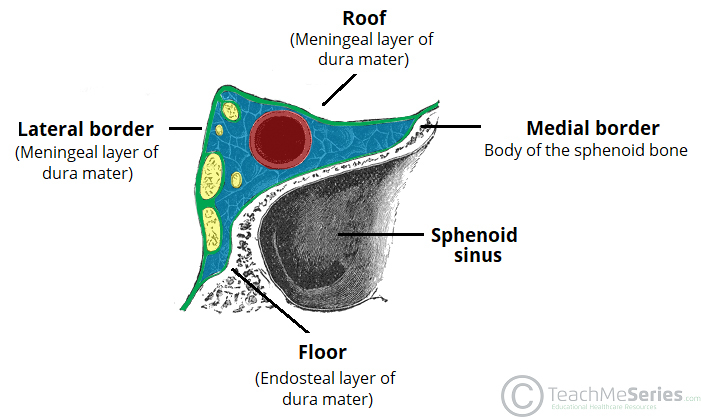 Roof – meningeal layer of the dura mater that attaches to the anterior and middle clinoid processes of the sphenoid bone. Floor – endosteal layer of dura mater that overlies the base of the greater wing of the sphenoid bone. Fig 1 – Coronal section demonstrating the borders of the right cavernous sinus. The cavernous sinus is the only site in the body where an artery (internal carotid) passes completely through a venous structure. This is thought to allow for heat exchange between the warm arterial blood and cooler venous circulation. Fig 2 – Coronal section demonstrating the contents of the right cavernous sinus. A useful mnemonic to remember the contents and their relation to one another is: O TOM CAT, where OTOM (oculomotor nerve, trochlear nerve, ophthalmic branch, maxillary branch) refers to the lateral wall contents from superior to inferior, and CAT (internal carotid artery, abducens nerve, trochlear nerve) refers to the horizontal contents, from medial to lateral. Ophthalmic veins (superior and inferior) – these enter the cavernous sinus via the superior orbital fissure. Central vein of the retina – drains into the superior ophthalmic vein, or directly into the cavernous sinus. Sphenoparietal sinus – empties into the anterior aspect of the cavernous sinus. Pterygoid plexus – located within the infratemporal fossa. It is important to note that the superior ophthalmic vein forms an anastomosis with the facial vein. Therefore, the ophthalmic veins represent a potential route by which infection can spread from an extracranial to an intracranial site. The cavernous sinuses empty into the superior and inferior petrosal sinuses, and ultimately, into the internal jugular vein. The left and right cavernous sinuses are connected in the midline by the anterior and posterior intercavernous sinuses. They travel through the sella turcica of the sphenoid bone. Fig 3 – Schematic of the dural venous system relating to the cavernous sinus. Note the anastomosis between the ophthalmic veins and the facial vein. Cavernous sinus thrombosis (CST) refers to the formation of a clot within the cavernous sinus. This most common cause of CST is infection; which typically spreads from an extracranial location such as the orbit, paranasal sinuses, or the ‘danger zone’ of the face. Infection is able to spread in this manner due to the anastomosis between the facial vein and superior ophthalmic veins. Common clinical features include headache, unilateral periorbital oedema, proptosis (eye bulging), photophobia and cranial nerve palsies. The abducens nerve (CN VI) is most commonly affected. Treatment is typically with antibiotic therapy. Where the cause is infection, thrombosis of the cavernous sinus can rapidly progress to meningitis. Which of the following structures is located medial to the cavernous sinus? With regards to the borders of the cavernous sinus, which of the following statements is TRUE? Which layer of connective tissue surrounds the cavernous sinus?